Biglar Poor Sadri, S., Dehghan Zade, H. (2014). Effects of Topping and Suckericide on Leaf Quality of Tobacco (Nicotiana Tabacum). International Journal of Advanced Biological and Biomedical Research, 2(3), 723-731. Shahram Biglar Poor Sadri; Hamid Dehghan Zade. "Effects of Topping and Suckericide on Leaf Quality of Tobacco (Nicotiana Tabacum)". International Journal of Advanced Biological and Biomedical Research, 2, 3, 2014, 723-731. Biglar Poor Sadri, S., Dehghan Zade, H. (2014). 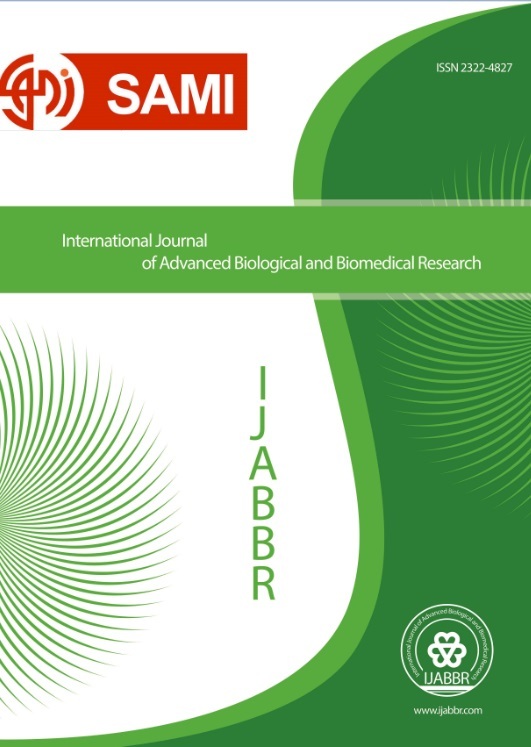 'Effects of Topping and Suckericide on Leaf Quality of Tobacco (Nicotiana Tabacum)', International Journal of Advanced Biological and Biomedical Research, 2(3), pp. 723-731. Biglar Poor Sadri, S., Dehghan Zade, H. Effects of Topping and Suckericide on Leaf Quality of Tobacco (Nicotiana Tabacum). International Journal of Advanced Biological and Biomedical Research, 2014; 2(3): 723-731. Bawolska M,LisZ(1988). The importance ofcultivar and of topping and suckering practicesin the production of flue-cured tobacco grownat wide spacings. PamietnikPulawski. 92: 45-60. Czubacka A,Doroszewska T,Trojak-Goluch A (2012). Agronomic characteristics of transgenic tobaccodoubled haploids resistant to Potato virus Y Journal of Food, Agriculture and Environment. 10 (4):374-378. Gooden DT, Brown AB, Ellington G, Fortnum BA, Marshall MW, Reay-Jones F (2011). South Carolinatobacco growers’ guide.Pp: 90Guo H, Kan Y, and Liu W, 2011. Differential expression of miRNAs in response to topping in flue-curedtobacco (Nicotianatabacum) roots.Plos one. 6 (12): 1-15. Gregor Z,DubravecK,BajketM(1992). Effect ofgrowth retardants on sucker growth anddevelopment in burley tobacco. PoljoprivrednaZnanstvenaSmotra. 57: 209-215. Hao J, Chao yang C (2001). Effects of topping and leaves remained on the yield and quality of flue-curedtobacco variety K326. Journal of Fujian Agricultural University.2001-2003. Hu GS, Li ZY, Mu L, Han JF (2000).Studies on characteristics of nicotine accumulation in NicotianatabacumL. China Tobacco Journal. 6(2): 6-9. Kara SM, Esendal E (1996). Correlatron and path analysis for yield and component in Turkish tobacco. Tob.res.22:101-104. Mahadevareddy M, PanchalCY,JanardhanVK,ManjunathS,KotiVR (1990). Effects ofdifferent methods of application ofsuckericides on sucker growth, leaf yield andquality in bidi tobacco. J. Maharashtra Agric.Univ. 15:201-204. Pandeya RS, Rosa N,Wite FH, Elliot JM (2001).Rapid estimation, of some flue-cured tobacco chemicalcharacteristics by infrared–reflectance spectroscopy.Tobacco science. 22:27-31. Patel BK, ChavdaCJ,ParmarJD (1996).Efficacy of different promising suckericidesand their combinations for sucker control inbidi tobacco. Tobacco Res. 22: 120-125. Reed TD, Johnson CS, Semtner PJ, Wilkinson CA (2012).Flue-cured tobacco production guide.Incooperation with the Virginia Bright Flue-Cured Tobacco Board.Pp: 140. Roton C,Wiernik A, Wahlberg I, Vidal B (2005). Factors influencing the formation of tobacco-specificnitrosamines in french air-cured tobaccos in trials and at the farm level. BeitragezurTabakforschungInternational/Contributions to Tobacco Research. 21: 305-320. Singh KD, Tripathi SN, Pandey AK (2000). Influence of topping on yield, physical leaf quality parametersand economic return in chewing tobacco. Tobacco Research. 1999. P: 61. Woltz WG, Mason DD (1966). Effects of plant spacing and height of topping of bright tobacco on someagronomic characteristics.Proc. 4th Intern.Tobacco SciCongr. Athens, Greece. pp. 197-207. Yi JH, Jia ZH, Sun ZJ (2006). Effect of the topping time on the root growth and the content of nicotine ofFlue-cured tobacco.Journal of Anhui Agriculture Science. 34(12): 2762- 2777.